Creating ‘Combat Mission’ scenarios from ‘Armchair General’ articles | Armchair General Magazine - We Put YOU in Command! As wargames continue to raise the bar of visual and action appeal, few reach the level of realism of the Combat Mission series from Battlefront.com. Gamers familiar with this series know that nearly every level of detail exists as we play on the virtual battlefields of Combat Mission, thanks to the countless hours of research and wargaming community support reflected in the game. We know that the soldiers will not follow our every order in battle, that range and ballistics can play crucial factors, and that the human-versus-human interaction can be an amazing challenge. Before there were wargames at this level of detail, many of us read battle accounts by soldiers who faced daunting incidents with their fellow soldiers and units, while also reading about tactics in manuals and magazines. 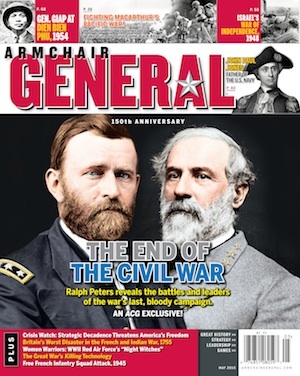 The articles in Armchair General magazine’s “Interactive” section apply many of these war stories and tactics to reader-decision roleplaying experiences. Many readers have made successful tactical decisions, while many like myself have failed miserably. With the recent release of Combat Mission Fortress Italy and its predecessor Combat Mission Battle for Normandy, I have pulled my old and current issues of Armchair General and recreated some of the many “Interactive” articles readers have enjoyed over the years. Although I have picked some of my favorites, here are some tips for turning your favorite ACG interactive articles into Combat Mission scenarios for play. First, not every interactive article will fit into the confines of CMBN or CMFI. Not all of the articles are set in World War II and some that are focus on actions that take place outside the CM games’ combat dates. While it may be easier and preferable to work with the current CMBN and CMFI battle dates, some discretion exists to create scenarios based on battle situations, both historical and fictional, outside those dates: the articles often challenge readers with a “universal” combat situation. For example, the article may be trying to emphasize the importance of reverse slope tactics, which played an important role in defense during World War II and continues to do so in modern warfare. (And quite possibly with the invasion of Martians!) Don’t feel that your favorite war story or Armchair General interactive article must remain true to the specific theater of operation you’re working with in Combat Mission (Normandy or Italy). Second, understand the order of battle on both sides and how the AI will need to play out to reflect the article’s strategic points. In the September 2005 Armchair General article, “A Ranger Squad Gets a Tall Order,” Rangers are specifically mentioned in the article; however, Combat Mission Battle for Normandy does not have Rangers readily available. Instead, I used elements of an infantry unit as a substitute. Testing your scenario design is always helpful to see if the scenario design settings of your units reflect the article. Third, the map conversion from the Armchair General combat articles to the Combat Mission scenario is one of the most critical factors on the virtual battlefield. While the Armchair General combat article maps are rough representations of what your units will navigate, it is important to not only recreate key terrain challenges for your units but to modify them for the in-game mechanics of Combat Mission. As I recreated the July 2010 article “Bocage Busting” in Combat Mission Battle for Normandy, I stayed as true to the map setup as possible while offering some slight changes in visual obstacles, elevation changes, and enemy setup zones. The article maps will not be minutely detailed, but this gives you discretion to spice up your own maps while remaining true to the essence of the map terrain and its challenges. The May 2012 Combat Decision Game article “82d Airborne Division in Sicily, 1943,” which can be created in Combat Mission Fortress Italy, may require additional research to fully understand the units, the effects of the terrain and other factors for an accurate scenario. Also, the addition of CMFI’s overlay feature will make map editing easier since it allows the in-game map editor to use Armchair General article maps. While there is a never-ending supply of resources from libraries, magazines and the Internet to create scenarios in Combat Mission, Armchair General offers some well-researched battle situations already set up as decision-making games that can be turned into scenarios for Combat Mission players to enjoy. Ed William, a wargamer of 15+ years, is a student of library and information science, which gives him a fair idea of how to do research for scenario creation. If you haven’t already discovered them, click here to see a list of Lt. Col. (ret) Jeffrey Paulding’s video tutorials for tactics in the highly detailed world of Combat Mission, an Armchair General special feature.